Bethany Simons is an award-winning writer and performer whose latest work, Reception: The Musical – a cabaret-style comedy collaboration with award-winning pianist Peter de Jager - was awarded Best Cabaret at the 2014 Melbourne Fringe Festival Awards. Born and raised in Dubbo, Bethany studied her Bachelor of Arts (Acting for Screen and Stage) (Honours) at CSU in Wagga Wagga. 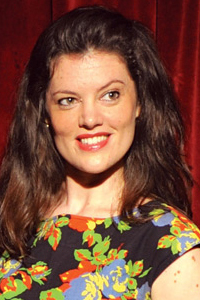 In 2009 she was nominated for 'Best Independent Female Performer' and 'Best New Writing for the Australian Stage' by the Green Room Association. Finding her inspiration in the everyday, Bethany believes that nothing is funnier or more beautiful than real life and true stories. Here Bethany shares why she’s committed to the storytelling of theatre and creating work that is universal, honest, uplifting and entertaining. I’m currently…based in Melbourne, juggling work as an independent writer, performer and producer. I also do a number of other things to fill my time: private acting coaching, running drama workshops, copywriting, presenting, voice-overs, writing articles for AussieTheatre.com and I’m also the Program Manager of Theatre Network Victoria. I’m so blessed that all of my work is either creative or theatre related! At school I...loved Drama, Music and English. I attended the same school from Kindergarten to Yr 12, so a lot of the teachers and students were like family. I enjoyed my school life and had a lovely group of friends. It was when I was in Yr 11 performing the lead role of Eliza Doolittle in My Fairy Lady that I decided I wanted to pursue acting as a career. My childhood was...wonderful. My Dad used to take us to a nearby town and tie a rope in a tree to make a swing and let us splash about in a creek – that was our holiday! We learnt to make our own fun. As a kid, I was either running around paddocks with cousins at my Nan and Pop’s place, impersonating family friends at the dinner table, or singing around the piano with my siblings. I chose CSU because …it offered an acting course with a program that was equally weighted between stage and screen. No other course I looked at had the Television Production facilities that CSU has. I was also drawn to the regional setting, as I’m a country kid. My best experience at CSU...was creating my Honours project in 2007 with my former acting lecturer as director. That little show (The Weather and Your Health) went on to be performed over 100 times across Australia and was nominated for two Green Room Awards in 2009. The 2011 tour of The Weather and Your Health was awarded the RAVE Touring Award from Regional Arts Victoria for outstanding contribution to regional arts and culture. The play has also been published by Australian Plays and was selected for the 2012 VCE Drama Playlist. In my profession it is important to… have a bit of ‘get up and go’. Being an independent artist can be hard work and you often have to make things happen for yourself. Being proactive when opportunities arise is key. I never dreamed I would … write an award-winning cabaret show about a receptionist! The biggest influence in my life... is my family. My brother is a performer, my sister is my biggest fan, my Mum is the best publicist you could ask for and Dad drives everybody miles to see me perform. My first play was about my Nan’s life and stories, so she remains a huge inspiration as her stories are what helped me to develop my writing voice for the stage. My greatest achievement is... having toured my first play throughout Australia. I especially adored performing for people in rural and remote communities. One night, our ‘venue’ was a shack on the side of a hill somewhere south of Wangaratta, Victoria. We got ready in a tent and performed for a packed house. After the show, we were enjoying an incredible supper provided by the local women when one of the locals piped up to say that they had raised enough money from ticket sales to be able to resurface their little tennis court. Everyone cheered. I’ll never forget that feeling. That same night, I spoke to a farmer who had never seen a show before - he told me the play was “bloody brilliant”. Fancy being somebody’s first experience of theatre! In the future I’d like to … continue doing what I’m doing! I love sharing my work with new audiences in all sorts of places. I’d love to tour again. I also have a lot of new ideas that I hope I find the time and money to develop in the future. I see it as a privilege to have a voice and a platform to share my view of the world.